So, we are driving to the Florida Panhandle Saturday for our family beach vacation and the weathermen on the radio start freaking out about “Tropical Storm Debby” (uh oh, my name is Debbie! Does this mean something?) coming in. Great-are we going to have to evacuate? Luckily not so far, but rained all day yesterday. I’m an optimist so I just decided it was going to be fun and an adventure no matter what happened. It is just great to be on vacation, take a break and re-energize. Our friends are flying in today-can’t wait for them to get here. So this morning it wasn’t raining so I decided to take off for a run. I thought it would be a good way to brainstorm for a blog plus I am one of THOSE PEOPLE who love to work out on vacation (you get to eat more that way!) Sidetrack, sorry I am ADD, yoga and running are 2 things you can do anywhere, did a yoga cd (p90x) yesterday since it was raining. Well anyway, I take pictures all the time so on my run I decided to take a picture of a Starbucks with palm trees and another runner came up to me and said, “are you taking a picture of that bear?” BEAR???? WHAT BEAR???? I turned around and there was a huge black bear across the highway!!! I tried to get some pics, got one where you can “bearly” see him! So I made a new friend (the runner not the bear), as I usually do, and we pointed out the bear to other runners and then I told the people hanging out at the Starbucks (and made even more new friends). 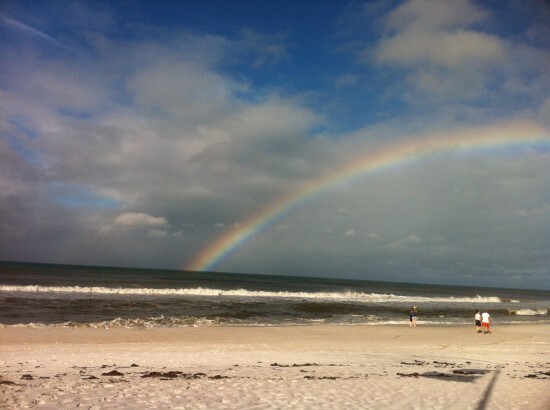 Then, I got back to our beach house and there was a huge rainbow stretching across the ocean! Where’s the balance in life? I want to blog regularly and life has been crazy lately. I keep thinking I have to have perfect conditions to sit down and share with you. (I am having trouble typing right now because my cat keeps nudging me for attention!-sorry I get easily sidetracked, my friend Linda says we have Bright Shiny Object Syndrome-we get easily distracted!). The needing perfect conditions got me thinking about how I am always seeking this magical balance. I am realizing it doesn’t really exist for me but that is ok, I need to just roll with it and be happy! Which I usually am happy, just frustrated because my To Do list is always so long. Is it just me or do you all have problems saying no and then getting overwhelmed with commitments? This year is crazy for me-I am making big exciting changes with Happy First, I am the chairman of our local Charity Ball, I am a runner and Mentor with Team in Training, and I am going to be on our PTA board this upcoming school year. It is all stuff I want to do! And then I didn’t plan on my mom being in the hospital/rehab/or ICU since January 29 and she lives 4 hours away. I am proud of myself-I actually said NO yesterday (and it was a little hard, because I don’t like to be left out). I was asked to do another position at school that I enjoy. But there is always next year. I think if we spread ourselves too thin, we can’t do anything well and our family doesn’t usually like our grumpiness then! Then I am feeling totally guilty for having any stress or frustration at all because I have some friends that are going through serious health problems (or their child is) or marriage problems so then I just feel grateful that I can be in the position to have too many fun things to do. So in conclusion, for me, there is no perfect balance, just a happy attitude and gratefulness! What are your thoughts? Would love to hear!